Welcome to Cisticola Tours LTD, your home for all East African Tours and Safaris. We offer top birding, wildlife, photography, landscapes, history and cultural tours in Kenya, Tanzania, Uganda and Rwanda. Our birding and wildlife safaris offer you the ultimate African safari experience. We have a wide variety of tour destinations and well-researched safari itineraries to suit every birder and nature enthusiast planning to visit Kenya, Tanzania, Uganda and Rwanda for a tour or classic safari. All our East African tours provide special photographic opportunities to help you capture those wonderful memories of Africa. Our tour leaders will assist you set up the perfect photos as they share their years of experience photographing African species and landscapes, while on safari. Our tour leaders are drawn directly from East Africa and bring vast safari experience in the field to help you enjoy each minute spent with us. Kindly take a look at “Our Tours” tab to see a selection of our famous birding and nature tours in Kenya, Tanzania, Uganda and Rwanda. If you do not find a tour that suits you, we are here to help you tailor-make a tour of your preference. Our safari team will work with you until you get the perfect itinerary for yourself or your group. Our work also contributes to sustainable projects (mainly through environmental education programmes) in Kenya, Tanzania, Uganda and Rwanda. We thank you for your continued support and look forward to continue making your safari dreams come true. East Africa is a World Class tour destination hosting some of the most interesting wildlife, people and landscapes. The biodiversity here is so diverse and the herds of big game are just breathtaking; forming the basis for a perfect African safari. From birds, great apes, big cats, wildebeest herds and magical flora; indeed this is the home of safari. East Africa hosts some of the most unique birds’ species in the World. Kenya, Tanzania and Uganda are among Africa’s top four countries in terms of highest birds’ species recorded per country; making them the top birding safari destinations in Africa. Indeed a birding tour in Kenya, Tanzania and Uganda gives you the best treat of African birding. In fact, East Africa is one of the most geographically varied tour destinations in the World. The region is home to a huge portion of the Great Rift Valley, two of the World’s top five largest lakes i.e. Lake Victoria (World’s second largest freshwater lake) and Lake Tanganyika (World’s longest and World’s second deepest lake), source of River Nile (World’s longest river), Africa’s top 3 highest mountain peaks, tropical jungles, majestic savannahs and breath-taking coastal beaches along the Indian Ocean. 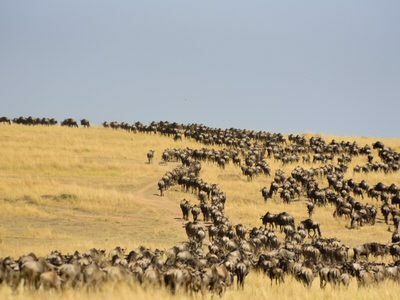 Above all, East Africa is home to the 8th Wonder of the World – the Annual Wildebeest Migration, best enjoyed on safari in Kenya’s Masai Mara and Tanzania’s Serengeti. Kindly contact us today to plan your next adventure in East Africa.